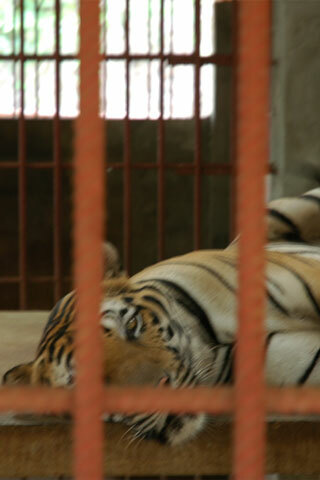 Photo: Tiger in cage at the Tiger Tample. Better known as the Tiger Temple, Wat Pha Luang Ta Bua Yanasampanno should absolutely not be visited—read on to find out why. Browse places to stay in Kanchanaburi on Agoda.com. Free cancellation. Opened in 1994, the site quickly exploded into a major attraction where tourists paid serious cash to cuddle and pet adult tigers and cubs. In 2016, the Thai Department of National Parks (DNP) raided the temple, discovering pelts and other illegal wildlife products while removing all of the tigers. For many years before the raid, we at Travelfish suggested that travellers steer clear of the temple due to widespread suspicions that tigers were being drugged. The situation was worse than we imagined. A resident monk—if you can call him that—was caught attempting to smuggle out the most incriminating evidence, and the frozen bodies of 40 cubs were found in a freezer. After months of standoffs with the monks and staff, the DNP finally removed 137 tigers and relocated them to government-run facilities. Some former volunteers expressed support for the temple’s abbot while worrying that the tigers would not be better off with the government. In our opinion, the evidence speaks for itself. At time of writing the Tiger Temple still shows up on tour brochures and is open to the public, we were told, but houses only birds, donkeys and a few other animals. There are no longer tigers at the Tiger Temple. We would not have visited back when it was booming, and we sure as hell would not go now. Last updated on 9th February, 2017. Browse our independent reviews of places to stay in and around Kanchanaburi. Read up on where to eat on Kanchanaburi. Check out our listings of things to do in and around Kanchanaburi. Read up on how to get to Kanchanaburi, or book your transport online with 12Go Asia. Planning on riding a scooter in Kanchanaburi? Please read this. See below for more sights and activities in Kanchanaburi that are listed on Travelfish.org. Where are you planning on heading to after Kanchanaburi? Here are some spots commonly visited from here, or click here to see a full destination list for Thailand.